Ever since I came across this craft here, I’ve been looking for an occasion to make KT do it for someone. With Teacher’s Day round the corner, I thought it will be a nice idea to make KT do it for her teacher. Although a very simple craft, KT was super thrilled to get her hands messy. I really liked the way it turned out. KT loved it too. She kept exclaiming, “Amma, peacock so beautiful!” She liked it so much that she didn’t want to give it to her teacher. I packed it in her school bag and had to convince her that we’ll do one more once she returns from school! I look forward to the day KT will write her own note of appreciation to the special people in her life. Until then, it is my duty. I added a small note behind the sheet for the teacher thanking her for the positive influence she has on KT and the many things she patiently teaches the kids. 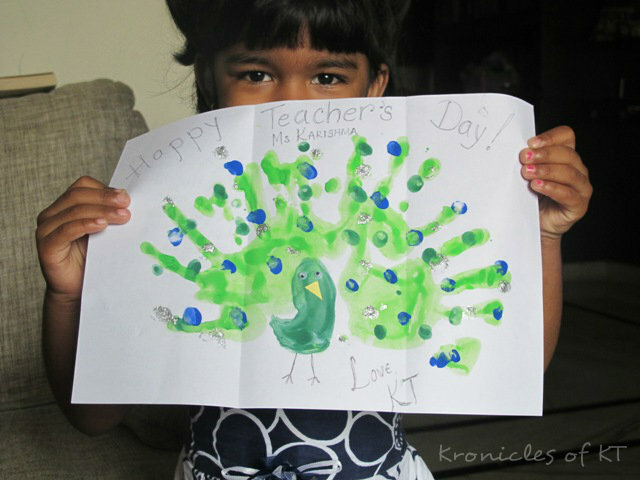 Do something special for your child’s teacher! They deserve a token of appreciation! Previous PostVisit to the Jingly Jangly ZooNext PostA Surprise Visitor!